Countless studies have shown that e-learning works. That’s not up for debate. But it’s still early days in its widespread use, which means there’s room for innovation and for improvement. As e-learning spreads to larger audiences, researchers and learning professionals have more case studies and more data to pull from. And this helps uncover what works and what doesn’t – and what to watch out for. 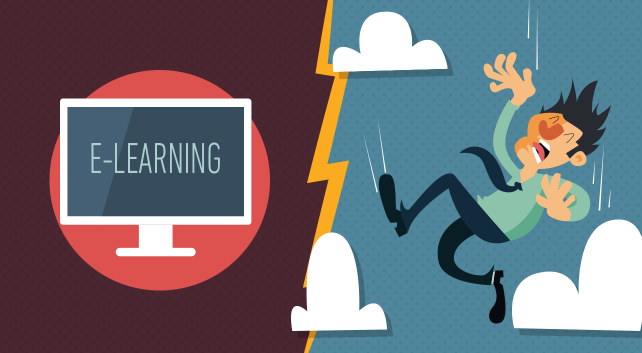 For example, a recent study out of the University of Chicago found a pitfall in e-learning that could negatively affect your talent development program. Fortunately, they also discovered how to guard against it. The researchers wanted to investigate e-learning and skill acquisition. Specifically, they wanted to see whether watching someone else perform a task in a video (think how-to videos) could lead a learner to become overconfident about their own ability to perform the same task. The researchers divided subjects into two groups. Both groups watched a quick instructional video on playing darts – specifically, how to hit the bull’s-eye. One group viewed the video once while the other group was shown it 20 times. Both groups were then asked to predict how many points they’d score by throwing a single dart at the dartboard. Then they actually did it. The one-time viewers’ predictions were pretty accurate – they overestimated their score by about 20% on average. But the group that watched the video 20 times was staggeringly overconfident. They overestimated their performance by a full 100%. “The more that people watched others, the more they felt they could perform the same skill, too – even when their abilities hadn’t actually changed for the better,” said the lead researcher. Apparently, once we get a little bit of information, we are extremely likely to overestimate what we know. A recent study found that people who recently searched the internet for information on a topic vastly inflated how much they knew about said topic. What’s worse, they also inflated how much they knew about a variety of other topics they didn’t even research. We seem to have difficulty differentiating what we know with everything there is to know on a certain subject. Obviously, this phenomenon isn’t limited to learners who get their information from the internet or online videos. It’s been shown to occur with every type of media and with every type of learner, from novices up to near-experts. So how can talent development professionals ensure that this common phenomenon doesn’t negatively affect workplace learning? Past and present research has revealed some effective ways to keep your learners from overestimating what they know. Have learners engage in active learning. It’s easy for a learner to overestimate their knowledge and skills after passively watching a video. So make learners actively engage with the material and utilize what they know through activities like group discussions, writing exercises or role playing. Not only will this help expose learners’ blind spots, but it will help them make the mental transition to consider how they will apply the new information on the job and in their specific role. Use assessments to keep things real. Consider building tests or quizzes into each new learning experience. Assessments are a powerful tool for showing learners what they actually know and what they need to improve. An assessment doesn’t need to be deflating to learners – in fact, it can be a powerful tool to reveal what areas they need to improve so they can specifically focus on those areas and boost their performance. The University of Chicago researchers found something that made learners reassess their inflated predictions – practice. Once learners were faced with the reality of successfully performing the skill, they could no longer live in their overconfident bubbles, and they revised their self-estimate accordingly. So practice makes perfect, but it also helps overconfident learners come back down to Earth.